Let’s start with your conventional house heated with an oil-fired central heating system. The average annual heating cost is $2,491! 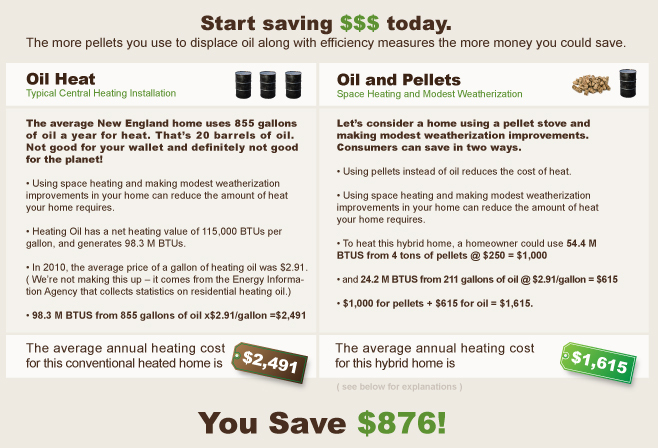 The average New England home uses 855 gallons of oil a year for heat. #2 Heating Oil has a net heating value of 115,000 BTUs per gallon, and generates 98.3 M BTUs. That’s 20 barrels of oil. Not good for your wallet and definitely not good for the planet! Like most homeowners, you probably install a pellet stove in your living room or kitchen, which creates heat where you need it most – in the rooms you actually use! Instead of heating a big, drafty house just so you can be toasty on the living room couch, pellet stove owners can create that same warmth a lot more efficiently, using a lot less energy. How do the cost of heating oil and pellets compare, per unit of energy? Thermal energy is measured in BTU’s or British Thermal Units. That means for every ton of wood pellets you use, you’ll save approximately $100 per ton, even before the additional savings possible through efficiency gains. In addition, homeowners may realize significant additional savings – in other words, by utilizing efficiency measures including space heating. How much less? Savings will vary for each home, but The American Council for an Energy Efficiency Economy conducted a study of the efficiency benefits of space heating, combined with modest weatherization improvements.1 In their study, homeowners installed a space heating appliance in their central living areas. The homeowners were instructed to use the space heating instead of their central heat during the more temperate months, to close off unused space and to leave bedroom doors open at night. Other efficiency measures included improving insulation, cutting air leaks from the homes and cutting registers to promote heat transfer from the first floor to the second floor in two story residences. Your actual savings would depend on several factors, like the configuration of your house, what weatherization improvements you make, the efficiency of your heating appliance and your behavior. But in the ACEEE study, participants were able to reduce their average energy consumption by 20-40% due to a combination of the benefits of space heating and these efficiency measures. Results will vary by installation, but taking the lower end of this range, our typical New England home could see a reduction of 20% in energy usage, requiring only 78.6 MBTU of heat. Wood pellets have a net heating value of 13.6 M BTUs per ton. $1,000 for pellets plus $615 for oil = $1,615. You could save $877! The more pellets you use to displace oil, and the more of these efficiency measures you take, the more you could save. What’s a BTU? A British Thermal Unit (BTU) describes a unit of energy. Measuring fuels by their BTU allows you to compare the heating values of different fuels. Aren’t oil prices volatile? You bet. The EIA tracks the price of residential heating oil. We’ll leave it to the oil futures analysts to predict what happens next. But we do know that during the last fifteen years, the price of residential heating oil has more than doubled. What qualifies as modest weatherization improvements? Weatherizing your home is a smart way to get the most out of your pellet stove. In the ACEEE study, homeowners were instructed to use the space heating instead of their central heat during the more temperate months, to close off unused space and to leave bedroom doors open at night. Other efficiency measures included improving insulation, cutting air leaks from the homes and cutting registers to promote heat transfer from the first floor to the second floor in two story residences. 1 McBride, Thomas, 'Zone Heating as a Low Income Energy Conservation Measure', ACEEE 1990 Summer Study on Energy Efficiency in buildings.